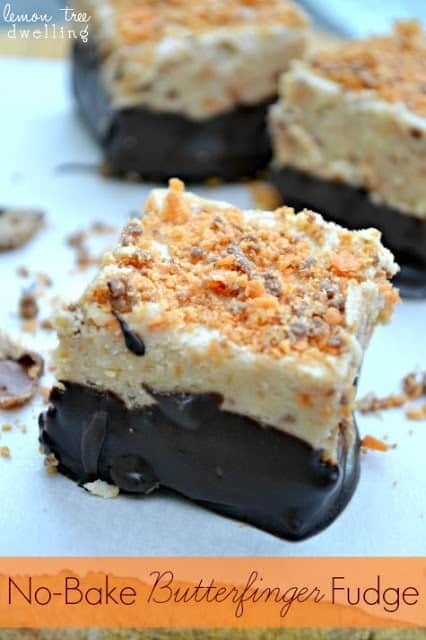 White Chocolate Peanut Butter Snickers Fudge will be the hit of your holiday party! 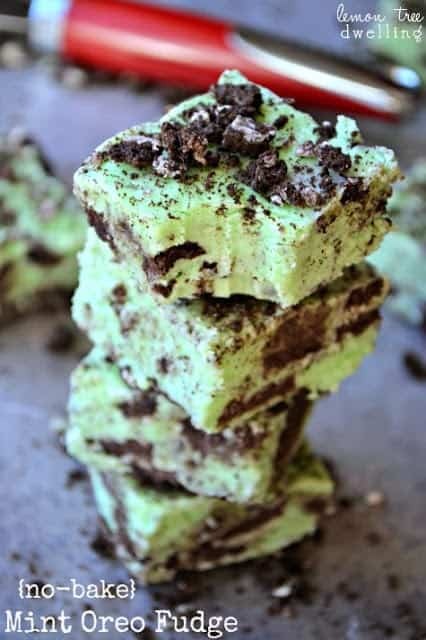 These creamy fudge morsels take 5 minutes or less to make, and 2 seconds to eat! Simply delicious and a perfect sweet treat. I can remember exactly how it all started. Sometime during my junior year, I signed up to volunteer at a summer camp for kids with disabilities. At that point, I thought I might want to go into special ed as a career, and I felt like the camp would be a good way for me to test the waters. As I was signing up, I found out there was another camp, for adults, a week later. And they were in need of volunteers….so I decided to give it a go. I was convinced I would LOVE the kid camp….and was hopeful I could tolerate the adults….but, wouldn’t you know, at the end of the two weeks, it was the opposite! So when it came time to find a placement for one of my classes senior year, I decided to seek out a placement with adults…..and my time at Lander House began. Honestly, I could write an entire book about my experiences there. But for now, let me explain what….if anything….this story has to do with fudge!! 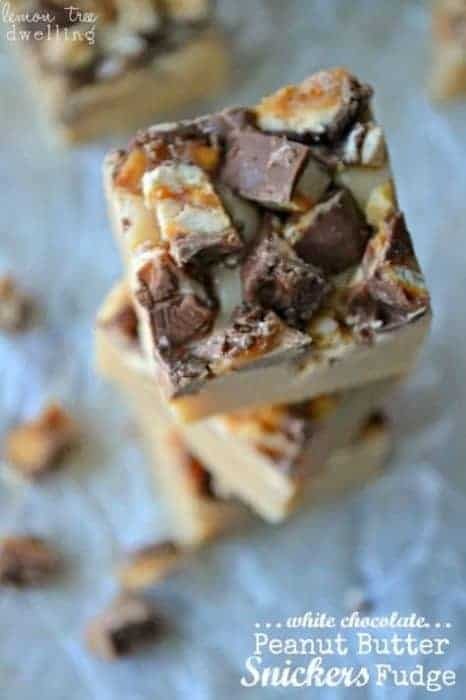 White Chocolate Peanut Butter Snickers Fudge – a change to the sweet side! Well, that has nothing to do with white chocolate peanut butter Snicker’s fudge, at least not directly. But it has to do with the way life takes us in a direction that is sometimes different than what we expected! Honestly, when I first started blogging, I thought Lemon Tree Dwelling would be mainly a home improvement blog. And then I realized that home improvement didn’t really capture my attention as much as crafts and recipes. And when I started getting more into recipes, I thought I would mostly post dinner recipes….because that’s what I thought I was good at. But then I started coming up with more and more dessert recipe, and I realized I really LOVE doing sweets! 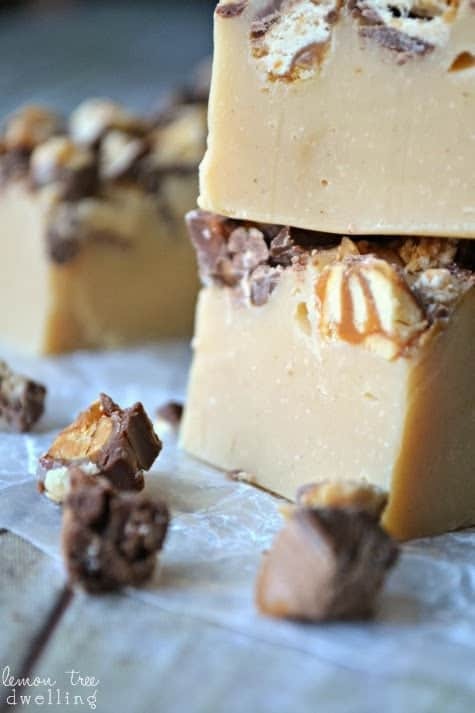 And as I made and photographed this White Chocolate Peanut Butter Snickers Fudge and thought about all the sweet ideas I still have floating around in my head, I couldn’t help but think back to the time when I was so SURE I wanted to work with those kids….and how wrong I turned out to be. Anyway…..back to the fudge. 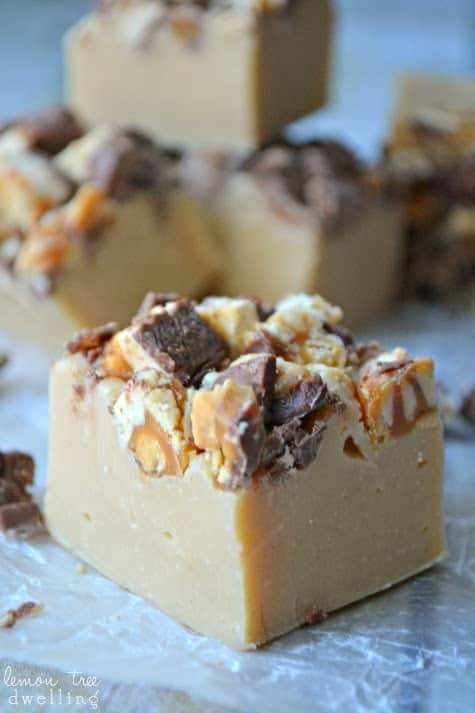 White chocolate peanut butter snickers fudge is smooth, creamy, and rich….just the way a holiday fudge recipe should be. 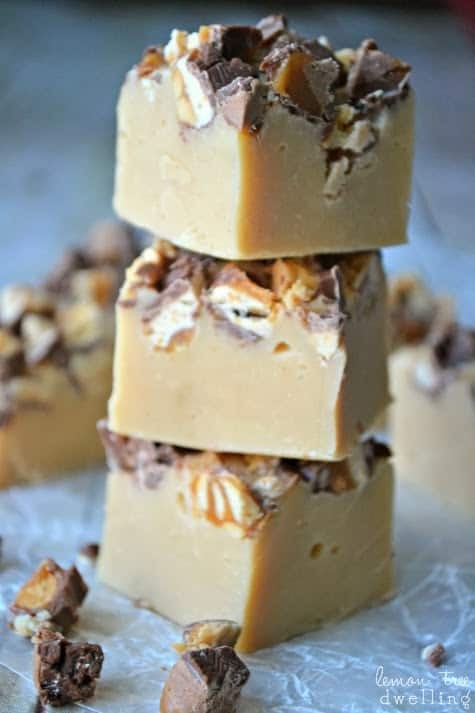 And it has the sweetness of white chocolate mixed with the saltiness of peanut butter, which creates a nougat-like flavor that is to die for….especially when you put the real thing on top! And best of all, it’s the easiest fudge I’ve ever made! Which proves that I’m not always wrong about the way that things will turn out…..especially when it comes to delicious sweets. In medium saucepan, heat sweetened condensed milk slightly. Add white chocolate and peanut butter and heat at medium-low temperature, stirring constantly, until white chocolate is completely melted. Pour into greased 6x9 inch or similar sized pan. Top with chopped Snickers, pressing them down gently into the top of the fudge. In the mood for fudge? 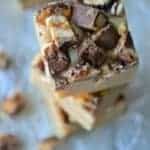 Check out my other easy fudge recipes! Are you following my Facebook Page? Head on over to Facebook and Like us today! Oh my heck Cathy! This fudge looks incredible! I have to make this – pinned! Looks scrumptious!! Thanks for sharing, Cathy! Pinned 😉 … Merry Christmas to you and yours!! This looks beyond good…this looks delicious! Snickers is one of my favorites…that and Almond Joy….not to mention chocolate and peanut butter. I can’t wait to try this. Fudge topped with Snickers? You just can’t go wrong with a combo like that! This looks and sounds just heavenly! 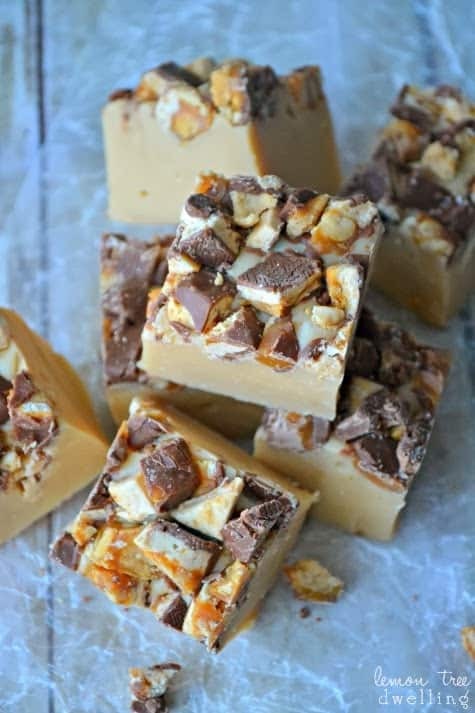 This fudge looks incredible Cathy! Love everything about this, the white chocolate, peanut butter and snickers – sounds amazing! I love how this looks super fancy and its just quick and easy! Your pics capture it’s deliciousness perfectly! What a great story, Cathy! That definitely isn’t your typical high school job but it did give you experience in a field, which is a good thing! 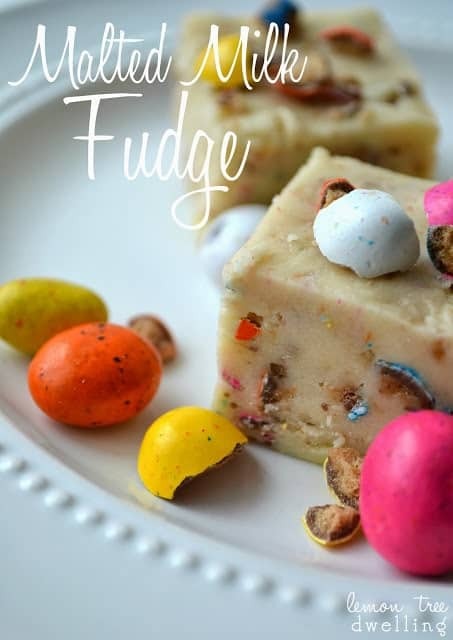 This fudge looks amazing. Peanut butter? Yep, I’ll take one! Thanks for sharing at Marvelous Mondays. Pinned. Have a great Christmas and New Years, Cathy! Looks really delicious and very simple to make – can’t wait to try it out. That sounds delicious, I like that you’ve used white chocolate instead of regular milk. Visiting from Link Party Palooza. Looks criminally good! I love easy!